Trans. Roy. Soc. Edinburgh 30: 623 (1882). 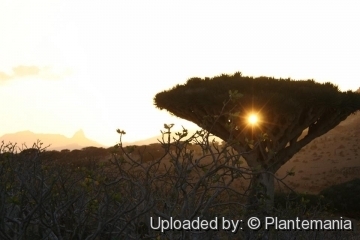 Origin and Habitat: Dracaena cinnabari is a dragon tree native to the Socotra archipelago in the Indian Ocean. It is fairly widespread, but has a fragmented distribution with different subpopulations showing varying degrees of vigour. Common and often abundant on the granite of the Haggeher mountains and adjacent limestone plateaus (for instance at Diksam, Reyged, Rewgid and Firmihin). There are also important outliers at Homhil and Hamaderoh and Igliso in the east. Over much of the eastern and southern limestone plateaus it is less common occuring as small relict populations or as isolated trees. It is completely absent from the western end of the island and sparsely distributed or even absent from large areas of the eastern Haggeher. It is likely that D. cinnabari was, in the past, widely distributed over large parts of Soqotra. Altitudinal range: From 250 metres above sea level to the highest parts of the mountains (about 1500 metes). Habitat and Ecology: This species is most commonly found in evergreen and semi-deciduous woodland preferentially on calcareous soils in areas receiving frequent low cloud, rain and drizzle during the monsoon. 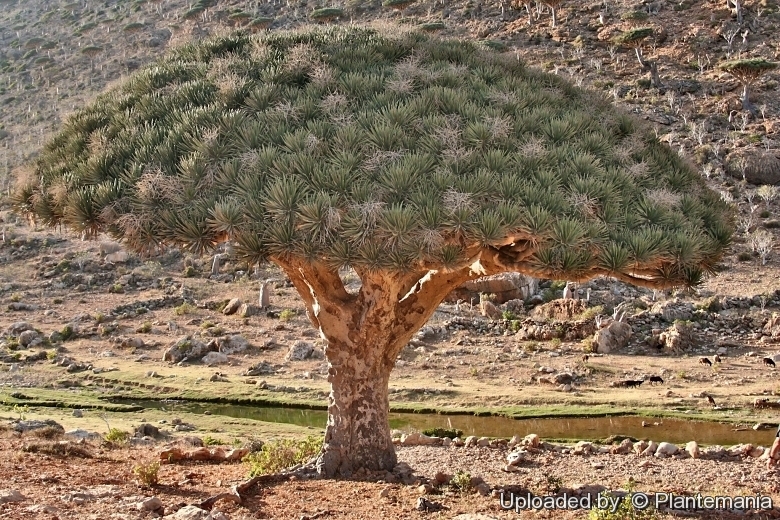 The unusual shape of the Dracaena cinnabari is an adaptation for survival in arid conditions with low amounts of soil, such as in mountaintops. The large, packed crown provides shade and reduces evaporation. This shade also aids in the survival of seedlings growing beneath the adult tree, explaining why the trees tend to grow closer together. The berries are eaten by birds and other animals and thereby dispersed. Of its various uses it is most famously known as a commercial source of dragon's blood. Current exploitation is small-scale but there is potential for more harmful exploitation to take place. The use of the growing leaflets for cordage has almost died out with the introduction of nylon rope. 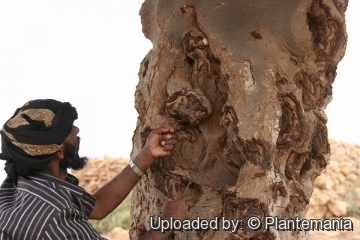 However, it is true that during severe droughts, leaflets are removed and cracked open as fodder for goats. It seems likely that a major cause of the decline in extent and quality of Dracaena woodland is the very gradual drying of the Archipelago. 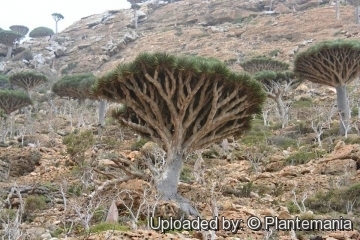 Description: The dragon blood tree, Dracaena cinnabari, is the most well known and identifiable tree of the island of Socotra. 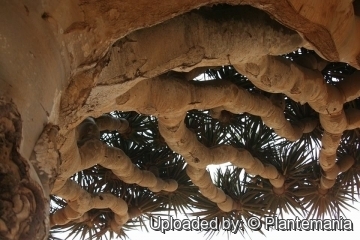 It has a straight or branched, strong trunk tha can grow to an height of up to 10 meters. This evergreen species has a unique and curious visual aspect, described as an upturned, densely packed crown having the shape of an uprightly held umbrella, this distinctive growth habit is known as dracoid habitus. This species is a major component of the landscape and is important not only as a flagship species but also as an indicator species (a species which flags changes in biotic and abiotic conditions). 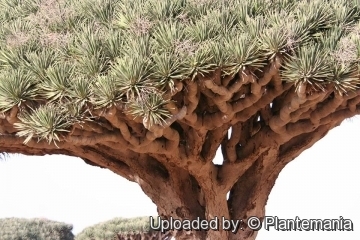 Of between 60 and 100 Dracaena species, D. cinnabari is one of only 6 species which grow as a tree (the other species are shrubs or geophytes producing below-ground rhizomes). 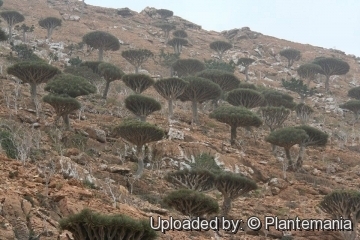 Dracaena cinnabari can live up to 600 years and greatly contribute to the uniqueness and ecological value of the island of Socotra. Derivation of specific name: The epithet 'cinnabari'; from Latin 'cinnabarinus', vermilion red, refers to the red sap (dragoon blood) that the trees produce. Stems: Like other monocotyledons, such as palms,this tree tree grows from the tip of the stem, with the leaves borne at the end. Most of the tree grow to around 5 m tall with a trunk diameter up to 40 cm (occasionally they can reach up to 10 metres in height). It branches at maturity to produce an umbrella-shaped crown. The trunk and the branches of the dragon blood are thick and stout and display dichotomous branching, where each of the branches repeatedly divides in two sections. Branching tends to occur when the growth of the terminal bud is stopped, due to either flowering or traumatic events (e.g. herbivory). Unlike most monocot plants, the Dracaenaceae display secondary growth, D. cinnabari even has growth zones resembling tree rings found in dicot tree species. Leaves: The leaves are found only in dense rosettes at the end of its youngest branches and are all shed every 3 or 4 years before new leaves simultaneously mature. The leaves are long, stiff , 30 to 60 cm long and 2-3 cm wide. Inflorescences (panicles) The inflorescences tend to grow 2 or 3 together in groups at the end of the branches, and bear small clusters of fragrant, white or green flowers. Fruits (berries): Small fleshy containing between 1 and 3 seeds. As they develop they turn from green to black and then become orange once they are ripe. The berries exude a deep red resin, known as dragon’s blood. Seeds: 4–5 mm in diameter and weighing on average 68 mg.
Phenology: It comes into flower in February, though flowering does vary with location and takes five months from flower fully ripe fruit. 2) Miller, A. 2004. Dracaena cinnabari. The IUCN Red List of Threatened Species 2004: e.T30428A9548491. http://dx.doi.org/10.2305/IUCN.UK.2004.RLTS.T30428A9548491.en. Downloaded on 05 June 2016. 11) Miller, Anthony G. & Morris, Miranda M. “Ethnoflora of the Soqotra Archipelago” Ed. by Ruth Atkinson. — Edinbourgh: Royal Botanic Garden, 2004. 13) Wikipedia contributors. "Dracaena cinnabari." Wikipedia, The Free Encyclopedia. Wikipedia, The Free Encyclopedia, 21 Apr. 2016. Web. 5 Jun. 2016. Cultivation and Propagation: Dracaena cinnabari is adaptable as an ornamental tree for parks, gardens but quite rare. It will grow in warmer Mediterranean climates, but prefers hot, dry, nearly desert conditions. Growth rate: It grows slowly. Fertilizing: Apply general garden fertilizer (10-30-10) including all micro nutrients and trace elements or slow release fertilizer to the planting bed at 3-month intervals, and to container plants at monthly intervals. Watering: Water regularly during the active growing season from March to September. No water should ever be allowed to stand around the roots. Keep almost completely dry in winter. Hardiness: This plant can be difficult to get it to look its best without a good amount of heat and sun and so it is only really suited to the tropics (USDA Zones 9-11). Keep the plant cooler in winter, but maintain the light as bright as you can so that any growth which it may produce at this time will not be etiolated. It can be grown outdoors in the summer months to benefit from direct exposure to light, and especially exposure to high summer temperatures. Pest & diseses: Scale and mealybugs. Rot it is only a minor problem with Dracaena if the plants are watered and “aired” correctly. If they are not, fungicides won't help all that much. 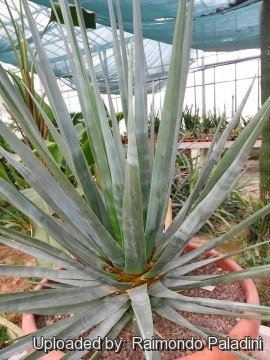 It is very unlikely to lose this plant from root rot from excessive water. Pruning: Remove dead and damaged leaves only; old leaves fall naturally from the outer limits of the leaf cluster: they may be removed easily with a light tug. Drastic pruning usually disfigures the plant. Traditional uses: The trees can be harvested for their crimson red resin, called dragon's blood, which was highly prized in the ancient world and is still used today. Around the Mediterranean basin it is used as a dye and as a medicine, Socotrans use it ornamentally as well as dying wool, gluing pottery, a breath freshener and lipstick. Dragon's blood from D. cinnabari was used as a source of varnish for 18th-century Italian violin-makers. It was also used as tooth-paste in the 18th century. It is currently still used as varnish for violins and for photoengraving. Dragon's blood has a deep, rich red colour. 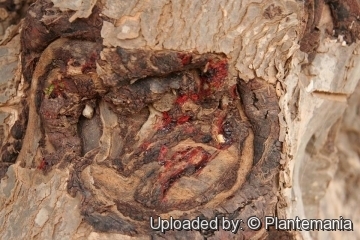 The resin appears in injured areas of the plant.